Item # 317052 Stash Points: 595 (?) This is the number of points you get in The Zumiez Stash for purchasing this item. Stash points are redeemable for exclusive rewards only available to Zumiez Stash members. To redeem your points check out the rewards catalog on thestash.zumiez.com. Freshen up your stinky space with the Troll Air Freshener from Stickie Bandits. 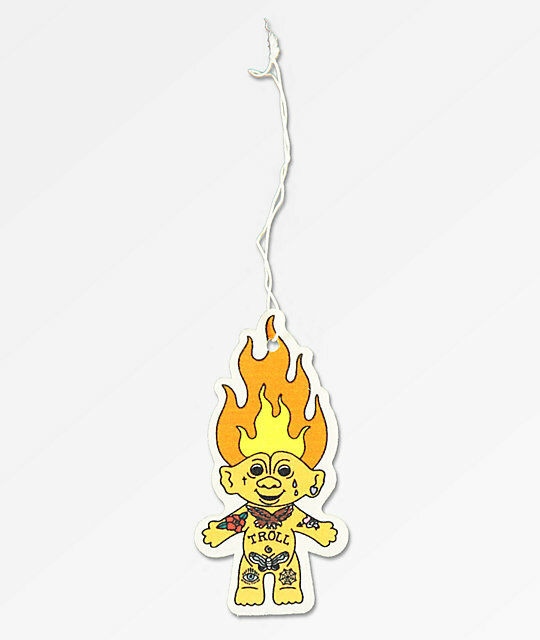 This "fresh ink" scented air freshener features double sided graphics of a tatted up troll doll with orange hair. Troll Air Freshener from Stickie Bandits. 4.5" x 2.25" &vert; 12 cm x 6cm.